Barry Carter is a poker writer, author and editor from Sheffield, England. He first discovered poker through a workmate who was winning a lot at the time and who taught him the game. This was back at a time which he describes as when "poker was easy and there was no such thing as the poker media". He was first approached by WPT magazine to write a few articles for them after they liked a few posts he had made on a forum. He quickly realised that he could make a career from writing about poker, as nobody was really doing it at the time. 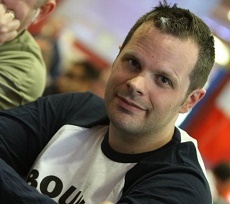 He has written for just about every major poker magazine and was formally the UK editor of PokerNews. In 2013 he won the APAT Award for Best Poker Media Provider. Carter is perhaps best known for co-authoring The Mental Game of Poker 1 & 2 with Jared Tendler. Both books with the well respected mental game coach were met with critical acclaim and have been sighted as the most influential poker books of all time by players such as Lex Veldhuis, Ben Tollerene and 2012 Main Event Champion Greg Merson. He joined PokerStrategy.com in 2011 as an editor and lead content writer. He is primarily responsible for news content, interviews and opinion pieces. Why do good players go broke? Should we call fish fish? Are live poker results reliable? How can we make poker more fun for recreational players? Would you encourage your children to play poker? How can we get more women to play poker? Aktywuj cookies w swojej przeglądarce. * Akceptuję Regulamin, Politykę Prywatności i Regulamin programu Tell-a-Friend.